↑ Dates follow the Julian calendar, used in England throughout Shakespeare's lifespan, but with the start of the year adjusted to 1 January (see en:Old Style and New Style dates). 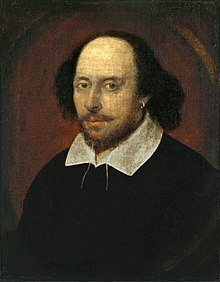 Under the Gregorian calendar, adopted in Catholic countries in 1582, Shakespeare died on 3 May. ↑ The "national cult" of Shakespeare, and the "bard" identification, dates from September 1769, when the actor David Garrick organised a week-long carnival at Stratford to mark the town council awarding him the freedom of the town. In addition to presenting the town with a statue of Shakespeare, Garrick composed a doggerel verse, lampooned in the London newspapers, naming the banks of the Avon as the birthplace of the "matchless Bard". ↑ Schoenbaum 1987, p. xv. ↑ Greenblatt 2005, p. 11. ↑ Bevington 2002, pp. 1–3. ↑ Wells 1997, p. 399. ↑ Dobson 1992, pp. 185–186. ↑ McIntyre 1999, pp. 412–432. ↑ Craig 2003, p. 3.